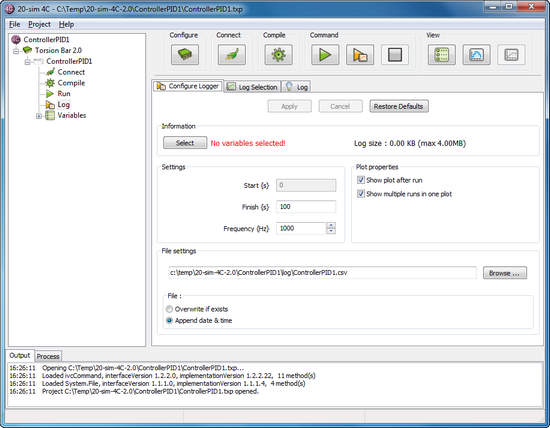 The second button of the Command buttons is Run with Logging button . If the button is green the logging has been configured and can be started. Pressing the button will start the model on the target with logging. After the period of logging (which can be configured) has passed, the logging data is transferred from the target to 20-sim 4C and saved to a file. The filename will be shown in the output window. Furthermore, the results will be shown in a plot that will be popped-up after the file has been stored. If the model is still running after logging, it can be stopped by pressing the stop button. After logging has been completed the results can be shown in a plot. If the Run with Logging is orange , the logging needs to be configured. 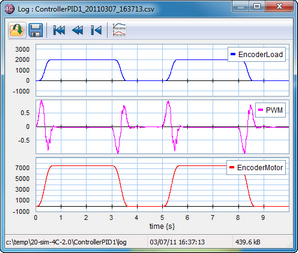 Pressing the Run with Logging button now will open the Configure Logger tab. In the Configure Logger tab you can select the log file. •Settings: The finish time and sample frequency can be specified here. By default, 20-sim 4C will log every sample and for the full run-time. You can lower the frequency to log, for example 1 of every 5 samples. In this way, you can log more variables simultaneously with similar memory requirements. •File settings: The filename and the directory can be specified by pressing either the Browse button or type the path and filename in the text field. Furthermore you can choose to overwrite existing files or to add the date & time to the filename. •Plot properties: A plot will be shown after the logging if the Show plot after run option is selected. Multiple runs will be shown in one plot if the Show multiple runs in one plot option is selected. You have to click the Apply button after the settings have been entered. The Run with Logging button will then change from orange into green. If an error occurs the Run with Logging button will turn into red.